During our walk-in crafting hours, you can come to the studio and choose to make anything from the craft menu (see below). These crafts are uninstructed and open ended. Let your creativity guide you and enjoy your time making something that is truly your own unique design! Our hours vary depending on time of year, private events and weather. Always check our current walk-in crafting hours before you stop by. You are always welcome to contact us with any questions. Click on the following button for walk-in crafting hours. All ages are welcome and encouraged to come make a mess and have some fun! Craftivate's expert crafters will be there to help you with any of your crafting needs, but no specific instruction will be given. Let us do the footwork for you by supplying everything you need in one place. You'll have the materials and space to make a beautiful mess without the headache of cleaning it all up or finding a place to store it in your home. The moms and dads out there will love the Crafty Basics Package. The Crafty Basics Package is perfect for school age kids that need complete all of those crafty school projects. You can even call ahead to let us know any specific supplies needed for the project and we can have them ready when the student arrives. If they are not included in the Crafty Basics Package then we will just add them on for you. Talk about easy! It has been one of our goals to offer daily crafting opportunities like this for all ages and we are thrilled that the time has come. 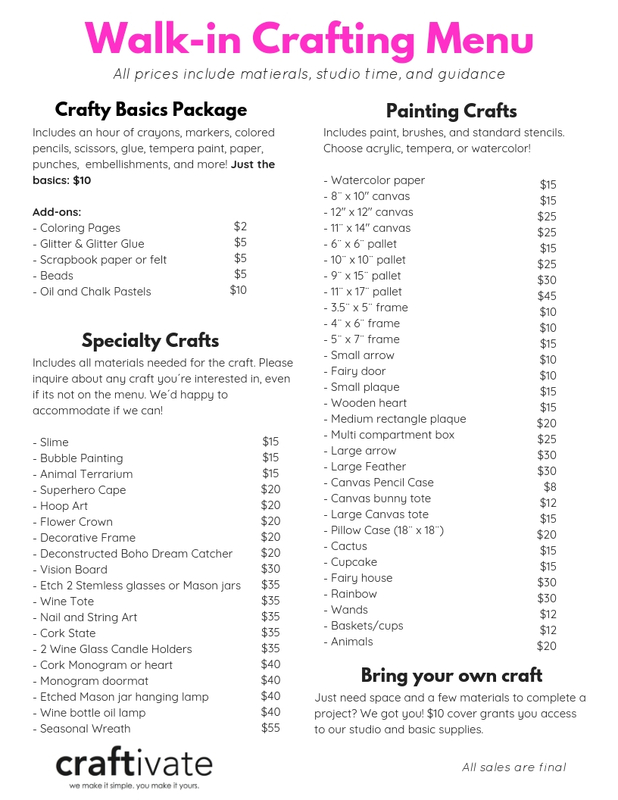 Craftivate is happy to offer hours and crafting activities that work for you so that you can come in and flex your creative muscles whenever the art bug bites. Craftivate also offers the opportunity for crafters to use the studio space for their own projects. We have the space, so why not share it with you! Bring your own supplies and simply pay a small studio fee of $10 per hour! ALSO check out our upcoming events and contact us with any questions. If you have any questions, please call the studio or send us a message through the form below.